With Invoice Editor, you can edit invoice details and details of work orders included to invoice. Note You can edit invoices in the Draft status and the New status only, and only if your user account is assigned to the Administrator role or the Accountant role. Important! You need to configure invoice editing options in the print template configuration used by Invoice Editor to allow deleting services and work orders, changing service amount, quantity, and hours, etc. 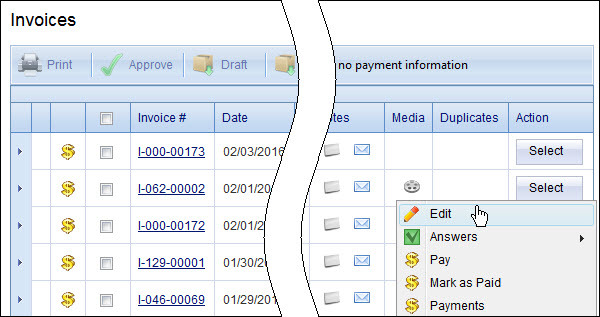 Tip Learn how to set up invoice editing options. On the Search pane, click New in the Status box, and click Search. On the Invoices page, in the Action column, point to the Select button next to the appropriate invoice, and then click Edit. Important! To save the changes you have made to the invoice, click the Save icon on the toolbar at the top of the Invoice Editor. The Invoice was saved successfully message should appear on the toolbar for a couple of seconds. ...in the Invoice Editor you can edit the date of invoices that belong to this type. You can change the invoice customer and owner, as well as edit the Claim#, Policy#, Deductible, and Accident Date fields. Click the Name field in the Owner section or in the Customer section, select the Wholesale option or the Retail option, and then type the owner’s name or the customer’s name. Tip You can type the first two letters of the owner’s name or customer’s name, and then select the appropriate owner or customer from the drop down list with suggested names. Note The Address field is filled in automatically after selecting an owner or customer. Click the field that you want to change and enter a new value. Note You cannot change the Insurance Company field. 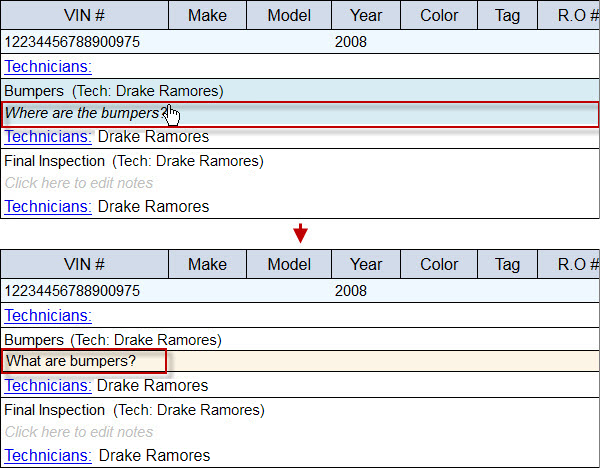 You can edit the VIN, Make, Model, Year, Color, Tag (license plate), RO#, and Stock# fields. Click any field and type the value that you want. You can change technician split for a particular service or for all services within a work order. Click the Technicians link below the service name, select or clear the check boxes next to appropriate technicians. Click the Technicians link above the services, select or clear the check boxes next to appropriate technicians, and then click OK in the Changing default employee for a work order will change split data for all services message. Note There are two modes of technician split: Evenly and Custom. By default, the Evenly mode is on, so service amount is divided equally among all assigned technicians. Click the Technicians link above the services or next to a particular service, and then in the Technicians list, click Custom. Select the check boxes next to the appropriate technicians, and enter the appropriate percentage or amount values next to selected technicians. ...until you adjust the technical split to the changed price. You can change service price, as well as add or edit service notes. Click the price, and type the appropriate values in the Amount and the Quantity boxes. Click the notes section below the service name, and type new notes or modify existing notes. 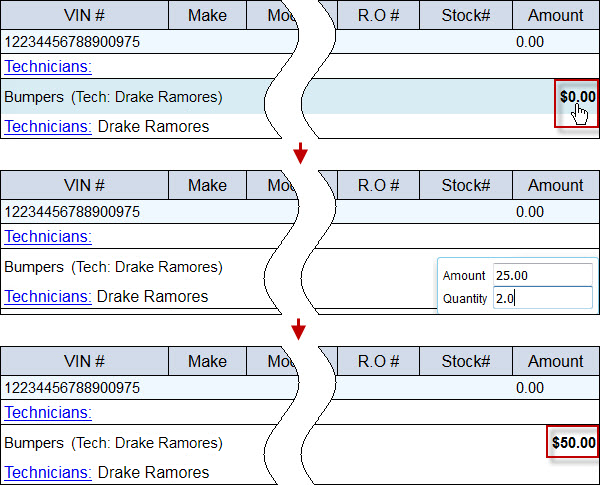 You can change the invoice status from New to Void, add purchase order to the invoice, and change the commission amount for any of the invoice work orders. Click the Void icon on the toolbar. Click the Unvoid icon on the toolbar. Click the Add PO icon on the toolbar, type PO#, if needed, enter notes and select the Approve invoice after payment check box, and then click Pay. Click the Commissions icon on the toolbar, type appropriate amount in the Commissions column for any of the work orders included to the invoice, and then click Update. You can delete work orders from the invoice if there are at least two work orders in the invoice. If there is only one work order in the invoice, you cannot delete it. 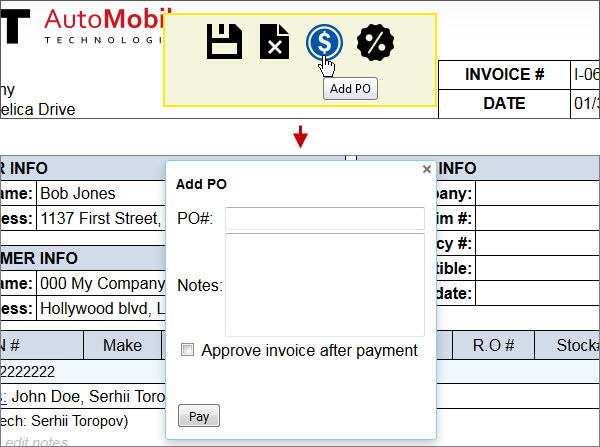 Click the Bin icon on the right, and then click OK in the Vehicle will be removed from invoice message. Important! After you click OK to confirm that you are sure about deleting the work order you will not be able to restore it, because it will be removed from the invoice immediately without the need to click the Save icon on the toolbar. You can mark work order services as deleted, and then click Save on the toolbar to delete them. Point to the service that you want to delete, click the Bin icon that appears on the right side, and then click OK in the Are you sure you want to delete this element message. Note Services marked as deleted are still shown in the list with a strikethrough formatting, so until you save the changes, you can restore such services. Point to the strikeout service, and then click the Restore icon that appears on the right side. Important! After you click Save on the toolbar, the service marked as deleted will be removed from the order and you will not be able to restore it.